Bruce Hagen, Jim Davidson and Scott Wolbers on the hill above Church Street in Burlington, Wisconsin. 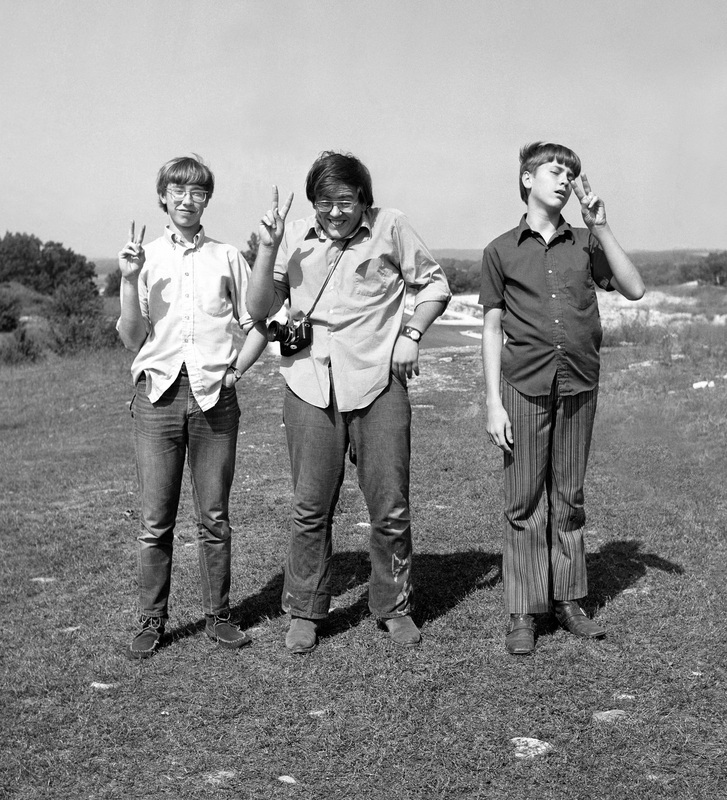 My best guess is that this image of best friends Bruce Hagen, Jim Davidson and Scott Wolbers was made in 1971 or 1972, when I would have been 15 or 16 years old. I borrowed a Yashica 124 twin-lens-reflex from my high school, and shot this image at the top of the hill near Church Street in Burlington. (Looks like I made a perfect exposure. 🙂 I probably developed the film in the darkroom at my high school, but I do not remember ever printing this wonderful shot. I’m positively thrilled to find these old negatives in such good shape. You can imagine that to me, a shot like this is absolutely priceless. I think this picture has to be one of the best pictures you have ever taken. It’s a classic. Dude, I heard you may have a pano of this hill? I DID shoot a panorama of the town from this spot, but I have not found those negatives – yet. I made a print and gave it to Mrs. Hagen. My first pano! Who’s the dude in the middle with all the hair? back.Like to see more photos from that era. I don’t think this would be the Bruce Hagen I went to school with in Wichita, KS. But Dude, you should sell this pic to a greeting card company! Or hold a contest for a caption. Er sumpthin.